Eyes light up at the sight of these tart and refreshing favorites. 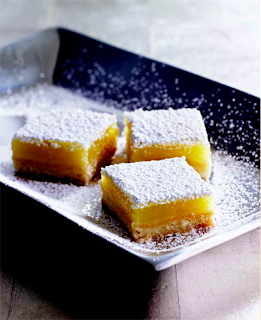 A soft, puckery lemon filling atop a vanilla scented shortcrust is just the ticket after a rich winter meal, and it is also a refreshing treat on a hot summer day. Okay, okay, it’s great anytime. Surprisingly easy to make, these bars deliver a lot of satisfaction for the amount of elbow grease invested. Of course lemon is the classic, but you could substitute lime juice as well. Or, for a more exotic version, try an equal amount of passion fruit juice instead of the lemon juice. 1 Preheat the oven to 350°F and position an oven rack in the center. 2 Line the pan with foil across the bottom and up all four sides, then lightly coat with melted butter, oil, or high-heat canola-oil spray. With the spatula, scrape the dough into the prepared pan and press it into an even layer across the bottom of the pan. Chill for 30 minutes. 3 Bake the chilled crust for 35 to 45 minutes, until golden brown. Transfer to a rack and allow to cool for 20 minutes. Reduce the oven temperature to 300°F. 4 Whisk the eggs and granulated sugar together in the medium bowl. Whisk in the flour until there are no lumps. Whisk in the lemon juice. Pour the filling over the crust. Bake for 50 to 60 minutes, until the filling is set and does not jiggle when you tap the side of the pan. Transfer to a rack to cool completely. When cool, refrigerate for 1 hour. The bars keep well at room temperature for 1 day. For longer storage, keep them airtight in the refrigerator for up to 3 days. The bars cannot be frozen, however, because the crust becomes soggy when defrosted. The wonderfully crisp and crumbly texture of this easy-to-use tart dough resembles a vanilla shortbread cookie, suitable to many types of fillings. There are different ways to make a shortcrust shell. This recipe offers two options for mixing the dough, with a food processor or by hand. There are also two options for forming the shell, by rolling out the dough or pressing it directly in the pan. 1 To mix the dough using a food processor: Place the flour, sugar, and salt in the bowl of a food processor. Pulse 5 times to blend. Add the cold butter pieces and pulse 6 to 8 times, just until the butter is the size of large peas. In the small bowl, whisk together the egg yolks, vanilla, and 1 teaspoon water. Add to the butter mixture, then process just until the dough begins to form small clumps, 5 to 10 seconds. Do not let the dough form a ball. Test the dough by squeezing a handful of clumps—when you open your hand, they should hold together. If they are crumbly and fall apart, sprinkle 1 teaspoon water over the dough and pulse several times, then test again. Repeat, if necessary. To mix the dough by hand: Place the flour, sugar, and salt in the medium bowl and blend well with the whisk. Add the cold butter pieces and toss until they are lightly coated with the flour. Use the pastry blender or your fingertips to cut the butter into the flour until the mixture resembles bread crumbs or crushed crackers. If at any time during this process the butter softens and becomes warm, place the bowl in the freezer for 10 minutes before continuing. In the small bowl, whisk together the egg yolks, vanilla, and 1 teaspoon water. Add to the dry ingredients and toss between your fingertips or with a fork 20 to 30 times to evenly distribute the moisture. The dough will still look very crumbly, but if the mixture is squeezed in your hand, it should hold together. If not, sprinkle another teaspoon of water over the top and toss to blend. Repeat, if necessary. 2 Finish the dough: Turn the dough out on a lightly floured work surface and knead gently 2 or 3 times, just to finish bringing it together. Shape it into a disk about 6 inches in diameter. If the dough is still cool to the touch, continue on to the next step. If the dough is soft and sticky, wrap it in plastic and refrigerate for 30 minutes before continuing. 3 To make the tart shell by rolling the dough: Make sure the dough is cool but malleable. If it has been refrigerated or frozen and is quite hard, let it sit on the counter for 10 to 12 minutes before rolling; otherwise, the dough will crack under the pressure of the rolling pin. Since it’s difficult to remove this dough from the work surface without tearing it unmercifully, place the dough disk between two 14-inch pieces of waxed paper, parchment paper, or plastic wrap. Roll it into an 11-inch round, rotating it (and the paper) clockwise slightly after each roll to create an even round. Remember to roll from the center outward and to lift the rolling pin at the edge to avoid smashing the edge into the paper, which will make removing the paper difficult. As you roll, the paper or plastic wrap will get wrinkled into the dough. When this happens, peel it off, smooth out the wrinkles and lay it back on the dough. Flip the dough over and repeat, if necessary, with the top piece. Continue to roll, flipping and smoothing wrinkles as necessary, until the dough is 11 inches across and between ¹⁄8 and ¼ inch thick. If the dough is soft and sticky, transfer it to a baking sheet and chill it for 30 minutes. Peel off the top piece of paper or plastic. Leave the bottom piece attached—this will hold the dough together while you transfer it to the pan. Lift the dough by the exposed paper or plastic and flip it over and center it over the tart pan as best you can. Peel off the paper or plastic. (If it sticks and won’t come off, place everything on a baking sheet and chill for 30 minutes—the paper will then peel off easily.) Ease the dough across the bottom of the pan and up the sides, pressing it into the corners of the pan with your fingertips. If the dough breaks or cracks, just press it together again. Once the dough is even in the pan, fold the excess dough at the edge inward to create a double layer of dough along the wall. Press firmly with your thumbs to fuse the two layers of dough, then roll your thumb over the rim of the pan to remove any excess dough there. Save the excess dough in case a crack forms in the crust during baking. Refrigerate for 1 hour or freeze for 30 minutes before baking. To make the tart shell by pressing the dough into the pan by hand: First, chill the dough for 30 minutes. Break the cold dough into small pieces roughly an inch or two in diameter and scatter them evenly over the bottom of the tart pan. Use the heel of your hand to press the pieces of dough flat, connecting them into a smooth, even layer. Press from the center of the pan outward, building up some extra dough where the bottom meets the side. Using your thumbs, press this excess up the sides of the pan to form the walls, making sure they are the same thickness as the dough on the bottom of the pan. Roll your thumb over the rim of the pan to remove any excess dough (save this for patching any cracks that might form during baking). Refrigerate for 1 hour, or freeze for 30 minutes before baking. Professionals have to keep one step ahead, and you can follow their lead. Both this shortcrust dough and Easy Chocolate Press-In Dough (page 212) may be refrigerated, wrapped in plastic, for up to 3 days, and they also freeze beautifully for up to 6 weeks. So, when preparing tart dough, think about doubling or tripling the recipe and refrigerating or freezing the extra batches. To freeze made-ahead doughs, flatten each batch of dough into a 6- or 7-inch disk, double-wrap in plastic, and slip into a resealable plastic freezer bag. Thaw overnight in the refrigerator or on the counter for 1 hour before using. To make life even easier, roll or press the dough into the tart pan(s) immediately, then wrap the entire pan in plastic wrap and freeze in a resealable plastic bag. Be sure to include a nub of dough left over from trimming, to patch any cracks that form during baking. Then, when you want a tart, all you need to do is unwrap and pop it the preheated oven, allowing 3 to 5 extra minutes for baking.